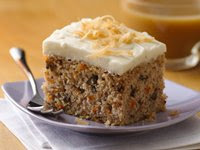 Turn Betty Crocker® Gluten Free yellow cake mix into a delicious homemade carrot cake. Heat oven to 350 degrees F. Grease bottom only of 8- or 9-inch square pan with shortening, or spray with cooking spray. Calories 420 (Calories from Fat 140); Total Fat 16g (Saturated Fat 9g, Trans Fat 0g); Cholesterol 90mg; Sodium 310mg; Total Carbohydrate 66g (Dietary Fiber 0g, Sugars 48g); Protein 3g. Daily Values: Vitamin A 40%; Vitamin C 0%; Calcium 2%; Iron 2%. Exchanges: 1 Starch; 3 1/2 Other Carbohydrate; 0 Vegetable; 3 Fat. Carbohydrate Choices: 4 1/2. This entry was posted on 9:05 PM and is filed under Gluten Free . You can follow any responses to this entry through the RSS 2.0 feed. You can leave a response, or trackback from your own site.